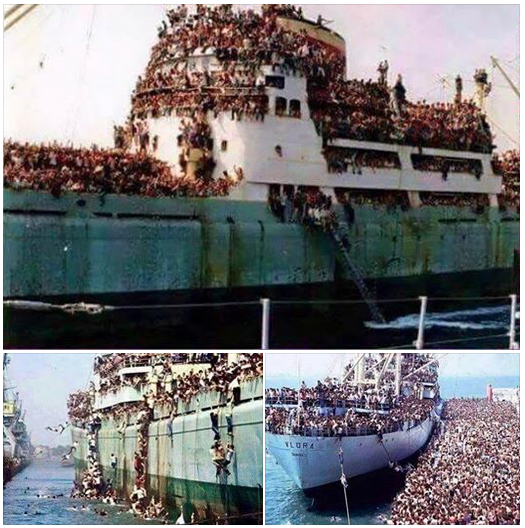 "These aren't Syrians, Libyans or Africans; they are Europeans trying to get to North Africa during the last world war. So, next time you think of closing the borders you might want to check with your grandparents. ". I tried a reverse image search for this image in google. But this didn't yield any useful or reputable websites which describe the incident shown in the photo. On the other hand there are lot of less well known web pages which publish this image with similar provoking captions. Is it really a photo as it is being claimed? Nope, they're Albanians in 1991. The ship in that image is the Vlora, or at least the back half of it, full of Albanian refugees going to (or arriving in) Bari, Italy in the summer of 1991. The early 90's were a bit rough for Albania. The fall of communism, economic collapse, food shortages, unrest; all the usual causes of a refugee crisis. Apparently, Albanians had a pretty rosy view of Italy at the time, as previous crossings had been (relatively) successful for the migrants who made it. This crossing however was less successful, and the refugees lived in pretty poor conditions until authorities got control of the situation. Shortly after, Italy offered financial aid and food relief to Albania in exchange for taking the refugees back. The situation in Albania improved after this event due to international/Italian aid. Not the answer you're looking for? Browse other questions tagged immigration refugees .